Explore California's California Coast Tour is our flagship trip. You'll be treated to an insider's view of iconic hot spots from San Francisco all the way to Los Angeles as we travel south along Highway 1 through the spectacular Big Sur region. Sit back, relax, and let your driver do the work as you soak up the dramatic scenery and the vibe of Santa Cruz, Monterey, Big Sur and Santa Barbara. Explore the coast with stops along the 17-Mile Drive, Pebble Beach, and at the famous Bixby Bridge. Take a tour of the world-class Monterey Bay Aquarium and of historic Hearst Castle. Hearst Castle, the Monterey Bay Aquarium, Big Sur, Solvang, Santa Barbara and more. After we pick you up in the morning at your hotel in San Francisco, we head straight for the serene beauty of the world­-renowned Coastal Highway 1. The Pigeon Point Lighthouse, a roadside berry farm and some of the beautiful untouched beaches are our favorite stops before we get to the surf town of Santa Cruz, where you will have time to explore on your own. Continuing to Monterey, we arrive at historic Cannery Row with ample time to explore the incredible Monterey Bay Aquarium or to just get lost in the maze of shops, tasting rooms and spots with unbelievable ocean views as you enjoy the afternoon at your leisure and at your own pace. Start with a drive along world-famous 17-Mile Drive. Take a meander around Pebble Beach and marvel at the immaculate grounds. Discover hidden galleries and alleyways tucked in amongst the "storybook cottages" in delightful Carmel-by-the-Sea. Drink in the phenomenal views during the scenic drive through Big Sur. Visit one of the world's largest elephant seal colonies in San Simeon. 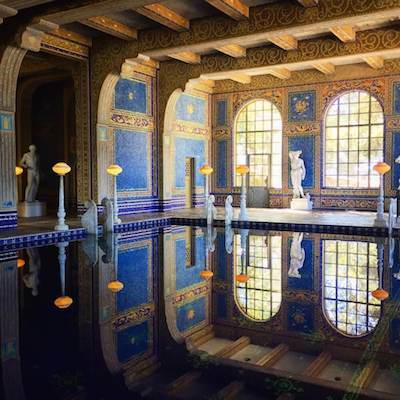 Finish the day with a fascinating tour at Hearst Castle, or choose have a relaxing afternoon at your hotel. Enjoy an evening stroll and dinner at your leisure in the quaint village of Cambria. The journey south continues with a morning drive to the Danish town of Solvang. Savor a decadent pastry from one of the town's many Danish bakeries. Take in the views of the Santa Ynez Valley and the vineyards that cover the hillsides. 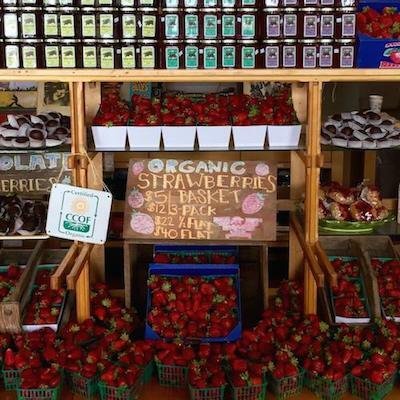 Wander through the heart of picturesque Santa Barbara. Relax during a scenic train ride that brings you right into the heart of Los Angeles to finish your tour. We offer three different accommodation packages for our California Coast Tour. Prices listed are per person, and are based on occupancy. Rooms on this tour are single (one person per room) or double (two people per room) occupancy. Please note that the rooms booked on your tour may not be identical to those pictured below. First night at the Victorian Inn (3-stars) in Monterey, in Standard King or Double Queen rooms. Second night at the Bluebird Inn (2-stars, pictured above) in Cambria, in Standard King or Double Queen rooms. First night at the Victorian Inn (3-stars, pictured above) in Monterey, in Courtyard King or Double Queen rooms. Second night at the Bluebird Inn (2-stars, pictured above) in Cambria, in Deluxe King or Double Queen rooms. Comfort Plus stays at the same properties as our Comfort package, in an upgraded room class at each hotel. First night at the Spindrift Inn (4-stars, pictured above) in Monterey, in Cannery Row King rooms. All of the rooms we use at this property have one king bed. If you require two beds in your room, please contact us about options. Second night at El Colibri Hotel & Spa (3-stars) in Cambria, in Traditional King or Double Queen rooms. Pick up on the trip's first day at any hotel within the city of San Francisco. Luggage restrictions: Each passenger is allowed 1 large bag that must be kept to a maximum weight of 50 pounds (22.5 kilograms), and not exceed 75 linear inches (linear inches=length+width+height). In addition, each passenger is allowed one smaller, "carry-on" sized bag, such as those that fit in the overhead compartment of a plane, and one piece of hand luggage, such as a purse or small backpack. These limits are strictly enforced. Please contact us if you have any concerns about our luggage restrictions--we will see what we can do to help you to work something out! A 6% transaction fee will apply for online bookings. This fee does not apply for bookings made directly through us; please contact us for details or with questions. Please note that this is a one-way tour that begins in San Francisco and ends in Los Angeles. You may also choose to end your trip in Santa Barbara. If you would like to return to San Francisco at the end of the trip, we can arrange return transport for an additional fee. Please contact us for more information. Our California Coast Tour departs from San Francisco on Sundays and Wednesdays. Browse the calendar to view available departure dates. If your preferred dates are not listed, please get in touch and we will see what we can work out for you! Take a closer look at some of the spectacular places you'll see on our California Coast Tour!